Cron.Ar - LA.TE. ANDES S.A.
We are substantially expanding our analytical capacity with the incorporation of an LA ICP-MS (Laser Ablation, Inductively Coupled Plasma Mass Spectrometry) system with double in situ dating capability for age determinations using (U-Th-Sm)/He and U/Pb methods. The wide range of temperatures covered by these techniques (between 800°C and 40°C) will contribute to increase the reliability and accuracy of LA.TE. ANDES products. We will be covering a broad spectrum of the high demand for geo-thermochronological data currently existing in the country and the region. The addition of (U-Th-Sm)/He dating will allow us to extend the thermal window of our measurements up to 40°C and the dating limit at younger ages with greater precision. We will be then in grade of determine the generation of mountain chains and basins associated with cycles of high exhumation/burial rates younger than 10 Ma. The results obtained with this method can be combined with the fission track analysis data, thus defining the time-temperature trajectory experienced by a rock sample. 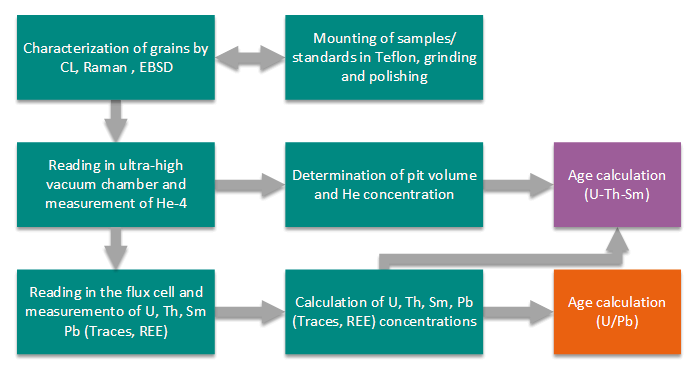 In addition and by means of the necessary adaptations, it is possible to use the equipment employed in the determinations of (U-Th-Sm)/He with the U/Pb dating method. Add to the thermochronology services already implemented, (U-Th-Sm)/He datings, increasing the accuracy and temperature range of the data obtained. This, combined with the incorporation of U/Pb datings and the development of a double dating system, will be of immediate application in the oil and gas industry. Subsequently it will be possible to extend this offer to industries such as mining or non-conventional energies like geothermics. Develop the skills of our own professionals in thermochronology (U-Th-Sm)/He and U-Pb geochronology techniques, key technologies for the oil, gas and mining industries and the scientific knowledge worldwide. Attain the transfer of knowledge and skills acquired in the industrial and academic areas toward universities and research centers. Apply thermochronometers and geochronometers (double dating) in a combined and simultaneous way, in order to determine thermal histories in a wide range of temperatures (850ºC to 40ºC). Reduce the exploratory risk of oil and gas by specifying the maximum temperatures reached by the organic matter present in the generating rocks, generation ages, chronology of the development of structural traps in conventional targets and burial sites, generation and accumulation of oil and gas in non-conventional targets, sedimentation ages of guide levels (pyroclastics), maximum sedimentation ages and provenance. Reduce the exploratory risk of mineral resources, determining emplacement ages of magmatic bodies linked to disseminated mineralization, ages of hydrothermal alteration processes, age and duration of mineralizing processes, exhumation rates, erosion and degree of preservation of primary mineralization, possibilities for development of supergene/exotic enrichment (post-mineralization), ages of base metal mineralization in veins and identification of potential areas with buried intrusives. Develop an innovative geothermal exploration tool at regional scale to identify potential hidden geothermal resources, define hydrothermal fluid migration zones and estimate their temperature, calculate thermal flows in a region with geothermal potential and identify advection zones and complex structural zones with potential increase of tectonic permeability. In situ Double dating process by (U-Th-Sm)/He and U/Pb dating methods.